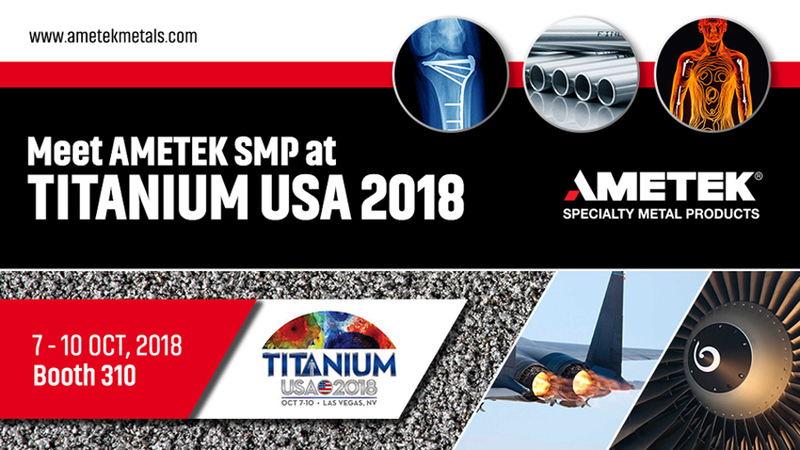 Three of the six businesses that comprise AMETEK Specialty Metal Products (SMP) - Reading Alloys, Superior Tube and Fine Tubes - will exhibit at TITANIUM USA 2018 from October 7th to 10th in Las Vegas. Hosted by the International Titanium Association (ITA), this event brings together titanium metal producers, distributors, raw material suppliers and consumers with over 90 exhibiting companies. Reading Alloys also manufactures high-purity hydride-dehydride (HDH) titanium powders for thermal spray/medical powders, powder metallurgy (P/M), sputtering targets and advanced coating alloys. US-based Superior Tube and UK-based Fine Tubes both have a wealth of metallurgical expertise in manufacturing custom seamless titanium tubing. Both tube mills specialize in developing high strength grades of titanium that offer significant weight savings including Ti CP (Grade 2), Ti 6Al/4V (Grade 5) and Ti 3Al/2.5V (Grade 9).